We ate at Ravalia's Fresh Pasta & Italian Grill last night, and I'm sure glad we did--the food was excellent, way beyond expectation. I was excited to learn that there was a new Italian place in town, and even more excited when I saw a few of the other "thumbs up" reviews on Urbanspoon.com. I am now one of them and a big fan, I'll definitely be back. We arrived on a Friday night to see what appeared to be a lot of cars in the area and a steady stream of people heading for the door. We were promptly greeted and told it would be a do-able 20 minute wait, unless we wanted to sit at the counter overlooking the kitchen. You bet! Score! I love watching a well-run kitchen at work, and that certainly was the case here. We saw then put out dish after dish for fresh made food and everything we saw looked amazing, from the pizza and calazones to the pasta dishes and even the sauce. Our waitress, Jen, promptly provided a wine menu and took our drink order while we perused the menu. Meanwhile a plate of bread magically appeared. It was excellent. We had olive oil and balsamic vinegar and a small dish for them and heartily dug in. The bread was great. And, by the way, the wine pour was a decent pour and good wine to boot. 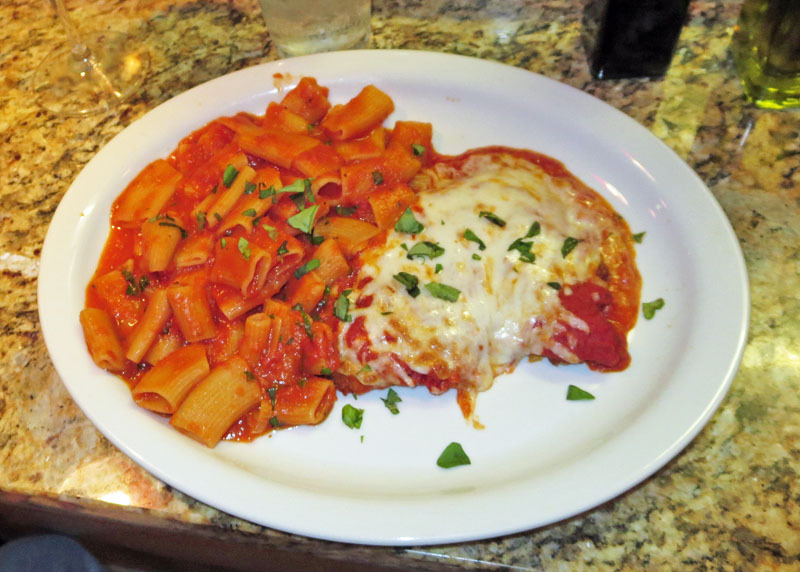 For his main course, Tommy had the Chicken Parmesan, and it was absolutely delicious. The chicken itself was quite tender, the parmesan flavor was good and the mozzarella nice and gooey. It was served with rigatoni that was quite al dente and a tomato sauce that was really excellent. The tomato sauce was very bright and flavorful, not too sweet, with a hint of acid (maybe red wine vinegar) that really brightened the flavor. I could probably drink it by the glass-full--it was that good. My only thought is that the rigatoni could have been cooked just a slight bit more, but they were still good. 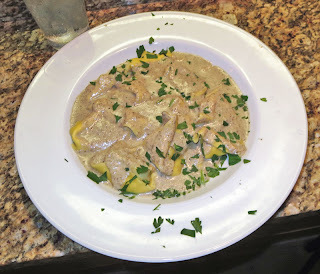 I chose the Tortellacci with Crimini Mushroom Cream Sauce. The flavor was outstanding. Tortellacci are large tortelloni which are in turn large tortellini. They were stuffe with sausage and were a very nice size, maybe 8-12 of them. The crimini mushroom cream sauce, while perhaps not the prettiest think on the plate, was an absolute delight to taste and eat. It had a nice, delicate mushroom flavor that did not overpower the sausage-stuffed tortellacci, which were themselves very good. The fresh pasta was evident, it was nice and tender as well. We had great service during our meal and a wonderful time watching the kitchen at work. The place is not very big, but sure was doing a nice business. the host (maybe the owner) was certainly evident and ensured the front of the house was moving smoothly. The head chef was definitely in control of the two other chefs in the kitchen. I was impressed overall by the smooth operation. One comment is that their web site, http://www.ravalias.com/, at the current time, only contains information and the menu from their original restaurant, in Casselberry. It needs a bit of updating as the Lake Mary menu is a bit different. But other than that, I cannot wait to return. Since my favorite Italian Restaurant in Lake Mary changed hands and then closed, I've been missing a place like Ravalia's. I'll definitely be back. I suggest you give it a try and let me know what you think!